"West Wall" redirects here. For the fortifications known in German as the Westwall, see Siegfried Line. For other uses, see Western Wall (disambiguation). Listen to the name in Hebrew. The Western Wall is considered holy due to its connection to the Temple Mount. Because of the Temple Mount entry restrictions, the Wall is the holiest place where Jews are permitted to pray, though the holiest site in the Jewish faith lies behind it. The original, natural, and irregular-shaped Temple Mount was gradually extended to allow for an ever-larger Temple compound to be built at its top. This process was finalised by Herod, who enclosed the Mount with an almost rectangular set of retaining walls, built to support extensive substructures and earth fills needed to give the natural hill a geometrically regular shape. On top of this box-like structure Herod built a vast paved esplanade which surrounded the Temple. Of the four retaining walls, the western one is considered to be closest to the former Temple, which makes it the most sacred site recognised by Judaism outside the former Temple Mount esplanade. Just over half the wall's total height, including its 17 courses located below street level, dates from the end of the Second Temple period, and is commonly believed to have been built around 19 BCE by Herod the Great, although recent excavations indicate that the work was not finished by the time Herod died in 4 BCE. The very large stone blocks of the lower courses are Herodian, the courses of medium-sized stones above them were added during the Umayyad era, while the small stones of the uppermost courses are of more recent date, especially from the Ottoman period. The term Western Wall and its variations are mostly used in a narrow sense for the section traditionally used by Jews for prayer; it has also been called the "Wailing Wall", referring to the practice of Jews weeping at the site over the destruction of the Temples. During the period of Christian Roman rule over Jerusalem (ca. 324–638), Jews were completely barred from Jerusalem except to attend Tisha be-Av, the day of national mourning for the Temples, and on this day the Jews would weep at their holy places. The term "Wailing Wall" was thus almost exclusively used by Christians, and was revived in the period of non-Jewish control between the establishment of British Rule in 1920 and the Six-Day War in 1967. The term "Wailing Wall" is not used by Jews, and increasingly not by many others who consider it derogatory. In a broader sense, "Western Wall" can refer to the entire 488-metre-long (1,601 ft) retaining wall on the western side of the Temple Mount. 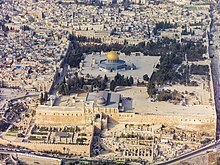 The classic portion now faces a large plaza in the Jewish Quarter, near the southwestern corner of the Temple Mount, while the rest of the wall is concealed behind structures in the Muslim Quarter, with the small exception of a 25 ft (8 m) section, the so-called Little Western Wall. The segment of the Western retaining wall traditionally used for Jewish liturgy, known as the "Western Wall", derives its particular importance to it having never been fully obscured by medieval buildings, and displaying much more of the original Herodian stonework than the "Little Western Wall". 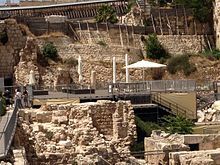 In religious terms, the "Little Western Wall" is presumed to be even closer to the Holy of Holies and thus to the "presence of God" (Shechina), and the underground Warren's Gate, which has been out of reach since the 12th century, even more so. Whilst the wall was considered Muslim property as an integral part of the Haram esh-Sharif and waqf property of the Moroccan Quarter, a right of Jewish prayer and pilgrimage existed as part of the Status Quo. The earliest source mentioning this specific site as a place of worship is from the 16th century. The previous sites used by Jews for mourning the destruction of the Temple, during periods when access to the city was prohibited to them, lay to the east, on the Mount of Olives and in the Kidron Valley below it. From the mid-19th century onwards, attempts to purchase rights to the wall and its immediate area were made by various Jews, but none was successful. With the rise of the Zionist movement in the early 20th century, the wall became a source of friction between the Jewish and Muslim communities, the latter being worried that the wall could be used to further Jewish claims to the Temple Mount and thus Jerusalem. During this period outbreaks of violence at the foot of the wall became commonplace, with a particularly deadly riot in 1929 in which 133 Jews were killed and 339 injured. After the 1948 Arab–Israeli War the Eastern portion of Jerusalem was occupied by Jordan. Under Jordanian control Jews were completely expelled from the Old City including the Jewish quarter, and Jews were barred from entering the Old City for 19 years, effectively banning Jewish prayer at the site of the Western Wall. This period ended on June 10, 1967, when Israel gained control of the site following the Six-Day War. Three days after establishing control over the Western Wall site the Moroccan Quarter was bulldozed by Israeli authorities to create space for what is now the Western Wall plaza. Jews may often be seen sitting for hours at the Wailing-place bent in sorrowful meditation over the history of their race, and repeating oftentimes the words of the Seventy-ninth Psalm. On Fridays especially, Jews of both genders, of all ages, and from all countries, assemble in large numbers to kiss the sacred stones and weep outside the precincts they may not enter. Early Jewish texts referred to a "western wall of the Temple", but there is doubt whether the texts were referring to the outer, retaining wall called today "the Western Wall", or to the western wall of the actual Temple. The earliest Jewish use of the Hebrew term "ha-kotel ha-ma'aravi", "the Western Wall", as referring to the wall visible today, was by the 11th-century poet Ahimaaz ben Paltiel. The name "Wailing Wall", and descriptions such as "wailing place", appeared regularly in English literature during the 19th century. The name Mur des Lamentations was used in French and Klagemauer in German. This term itself was a translation of the Arabic el-Mabka, or "Place of Weeping", the traditional Arabic term for the wall. This description stemmed from the Jewish practice of coming to the site to mourn and bemoan the destruction of the Temple and the loss of national freedom it symbolized. Late in the 19th century, the Arabs began referring to the wall as the al-Buraq Wall, and after the intensification of Arab-Jewish tensions in the 1920s this became the standard Arabic name, replacing the traditional El-Mabka. The new name was based on the tradition that inside the wall was the place where Muhammad tethered his miraculous winged steed, al-Buraq. The tradition on which this is based only states that the Prophet, or the angel Jibra'il (Gabriel), tethered the steed at the gate of the mosque, meaning: at the gate of the Temple Mount. The location of the entry gate identified as the one used by Muhammad varied throughout the centuries, from the eastern and southern walls, to the southwest corner, and finally to the western wall, and specifically to Barclay's Gate immediately adjacent to the "Wailing Place" of the Jews. Israeli archaeologist Meir Ben-Dov concluded that the Muslim association with Western Wall began in the late nineteenth century in response to renewed Jewish identification with the site. The Western Wall commonly refers to a 187-foot (57 m) exposed section of ancient wall situated on the western flank of the Temple Mount. This section faces a large plaza and is set aside for prayer. In its entirety, however, the entire western retaining wall of the Herodian Temple Mount complex stretches for 1,600 feet (488 m), most of which is hidden behind residential structures built along its length. Other revealed sections include the southern part of the Wall, which measures approximately 80 metres (262 ft), and another much shorter section known as the Little Western Wall, which is located close to the Iron Gate. The wall functions as a retaining wall, supporting and enclosing the ample substructures built by Herod the Great around 19 BCE. Herod's project was to create an artificial extension to the small quasi-natural plateau on which the First and Second Temples stood, transforming it into the almost rectangular, wide expanse of the Temple Mount visible today. At the Western Wall Plaza, the total height of the Wall from its foundation is estimated at 105 feet (32 m), with the exposed section standing approximately 62 feet (19 m) high. The Wall consists of 45 stone courses, 28 of them above ground and 17 underground. The first seven visible layers are from the Herodian period. This section of wall is built from enormous meleke limestone blocks, possibly quarried at either Zedekiah's Cave situated under the Muslim Quarter of the Old City or at Ramat Shlomo 4 kilometres (2.5 mi) northwest of the Old City. Most of them weigh between 2 and 8 short tons (1.8 and 7.3 t) each, but others weigh even more, with one extraordinary stone located slightly north of Wilson's Arch measuring 13 metres (43 ft) and weighing approximately 517 tonnes (570 short tons). Each of these ashlars is framed by fine-chiseled borders. The margins themselves measure between 5 and 20 centimetres (2 and 8 in) wide, with their depth measuring 1.5 centimetres (0.59 in). In the Herodian period, the upper 10 metres (33 ft) of wall were 1 metre (39 in) thick and served as the outer wall of the double colonnade of the Temple platform. This upper section was decorated with pilasters, the remainder of which were destroyed when the Byzantines reconquered Jerusalem from the Persians in 628. The next four courses, consisting of smaller plainly dressed stones, are Umayyad work (8th century, Early Muslim period). Above that are 16–17 courses of small stones from the Mamluk period (13–16th century) and later. According to the Hebrew Bible, Solomon's Temple was built atop what is known as the Temple Mount in the 10th century BCE and destroyed by the Babylonians in 586 BCE, and the Second Temple completed and dedicated in 516 BCE. Around 19 BCE Herod the Great began a massive expansion project on the Temple Mount. In addition to fully rebuilding and enlarging the Temple, he artificially expanded the platform on which it stood, doubling it in size. Today's Western Wall formed part of the retaining perimeter wall of this platform. In 2011, Israeli archaeologists announced the surprising discovery of Roman coins minted well after Herod's death, found under the foundation stones of the wall. The excavators came upon the coins inside a ritual bath that predates Herod's building project, which was filled in to create an even base for the wall and was located under its southern section. This seems to indicate that Herod did not finish building the entire wall by the time of his death in 4 BCE. The find confirms the description by historian Josephus Flavius, which states that construction was finished only during the reign of King Agrippa II, Herod's great-grandson. Given Josephus' information, the surprise mainly regarded the fact that an unfinished retaining wall in this area could also mean that at least parts of the splendid Royal Stoa and the monumental staircase leading up to it could not have been completed during Herod's lifetime. Also surprising was the fact that the usually very thorough Herodian builders had cut corners by filling in the ritual bath, rather than placing the foundation course directly onto the much firmer bedrock. Some scholars are doubtful of the interpretation and have offered alternative explanations, such as, for example, later repair work. Herod's Temple was destroyed by the Romans, along with the rest of Jerusalem, in 70 CE, during the First Jewish–Roman War. During much of the 2nd–5th centuries of the Common Era, after the Roman defeat of the Bar Kokhba revolt in 135 CE, Jews were banned from Jerusalem. There is some evidence that Roman emperors in the 2nd and 3rd centuries did permit them to visit the city to worship on the Mount of Olives and sometimes on the Temple Mount itself. When the empire started becoming Christian under Constantine I, they were given permission to enter the city once a year, on the ninth day of the month of Av, to lament the loss of the Temple at the wall. The Bordeaux Pilgrim, who wrote in 333 CE, suggests that it was probably to the perforated stone or the Rock of Moriah, "to which the Jews come every year and anoint it, bewail themselves with groans, rend their garments, and so depart". This was because an imperial decree from Rome barred Jews from living in Jerusalem. Just once per year they were permitted to return and bitterly grieve about the fate of their people. Comparable accounts survive, including those by the Church Father, Gregory of Nazianzus (c. 329–390) and by Jerome in his commentary to Zephaniah written in 392 CE. 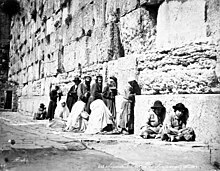 In the 4th century, Christian sources reveal that the Jews encountered great difficulty in buying the right to pray near the Western Wall, at least on the 9th of Av. In 425 CE, the Jews of the Galilee wrote to Byzantine empress Aelia Eudocia seeking permission to pray by the ruins of the Temple. Permission was granted and they were officially permitted to resettle in Jerusalem. Several Jewish authors of the 10th and 11th centuries write about the Jews resorting to the Western Wall for devotional purposes. Ahimaaz relates that Rabbi Samuel ben Paltiel (980-1010) gave money for oil at "the sanctuary at the Western Wall." Benjamin of Tudela (1170) wrote "In front of this place is the Western Wall, which is one of the walls of the Holy of Holies. This is called the Gate of Mercy, and hither come all the Jews to pray before the Wall in the open court." The account gave rise to confusion about the actual location of Jewish worship and some suggest that Benjamin in fact referred to the Eastern Wall along with its Gate of Mercy. While Nahmanides (d. 1270) did not mention a synagogue near the Western Wall in his detailed account of the temple site, shortly before the Crusader period a synagogue existed at the site. Obadiah of Bertinoro (1488) states "the Westen Wall, part of which is still standing, is made of great, thick stones, larger than any I have seen in buildings of antiquity in Rome or in other lands." Shortly after Saladin's 1187 siege of the city, in 1193, the sultan's son and successor al-Afdal established the land adjacent to the wall as a charitable trust. It was named after an important mystic Abu Madyan Shu'aib and dedicated to Moroccan settlers who had taken up residence there. Houses were built only 4 metres (13 ft) away from the wall. The first mention of the Islamic tradition that Buraq was tethered at the site is from the 14th century. A manuscript by Ibn Furkah, (d. 1328), refers to Bab al-Nab (lit. "Gate of the Prophet"),[dubious – discuss] an old name for a gate along the southwestern wall of the Haram al-Sharif. 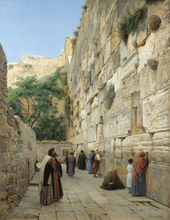 Wailing Wall, Jerusalem, by Gustav Bauernfeind (19th century). In 1517, the Turkish Ottomans under Selim I conquered Jerusalem from the Mamluks who had held it since 1250. Selim's son, Sultan Suleiman the Magnificent, ordered the construction of an imposing wall to be built around the entire city, which still stands today. Various folktales relate Suleiman's quest to locate the Temple site and his order to have the area "swept and sprinkled, and the Western Wall washed with rosewater" upon its discovery. At the time, Jews received official permission to worship at the site and Ottoman architect Mimar Sinan built an oratory for them there. In 1625 organised prayers at the Wall are mentioned for the first time. Over the centuries, land close to the Wall became built up. Public access to the Wall was through the Moroccan Quarter, a labyrinth of narrow alleyways. In May 1840 a firman issued by Ibrahim Pasha forbade the Jews to pave the passageway in front of the Wall. It also cautioned them against "raising their voices and displaying their books there." They were, however, allowed "to pay visits to it as of old." This wall is visited by all our brothers on every feast and festival; and the large space at its foot is often so densely filled up, that all cannot perform their devotions here at the same time. It is also visited, though by less numbers, on every Friday afternoon, and by some nearly every day. No one is molested in these visits by the Mahomedans, as we have a very old firman from the Sultan of Constantinople that the approach shall not be denied to us, though the Porte obtains for this privilege a special tax, which is, however, quite insignificant. 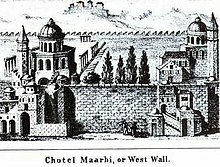 In the late 1830s a wealthy Jew named Shemarya Luria attempted to purchase houses near the Wall, but was unsuccessful, as was Jewish sage Abdullah of Bombay who tried to purchase the Western Wall in the 1850s. In 1869 Rabbi Hillel Moshe Gelbstein settled in Jerusalem. He arranged that benches and tables be brought to the Wall on a daily basis for the study groups he organised and the minyan which he led there for years. He also formulated a plan whereby some of the courtyards facing the Wall would be acquired, with the intention of establishing three synagogues – one each for the Sephardim, the Hasidim and the Perushim. He also endeavoured to re-establish an ancient practice of "guards of honour", which according to the mishnah in Middot, were positioned around the Temple Mount. He rented a house near the Wall and paid men to stand guard there and at various other gateways around the mount. However this set-up lasted only for a short time due to lack of funds or because of Arab resentment. In 1874, Mordechai Rosanes paid for the repaving of the alleyway adjacent to the wall. In 1887 Baron Rothschild conceived a plan to purchase and demolish the Moroccan Quarter as "a merit and honor to the Jewish People." The proposed purchase was considered and approved by the Ottoman Governor of Jerusalem, Rauf Pasha, and by the Mufti of Jerusalem, Mohammed Tahir Husseini. Even after permission was obtained from the highest secular and Muslim religious authority to proceed, the transaction was shelved after the authorities insisted that after demolishing the quarter no construction of any type could take place there, only trees could be planted to beautify the area. Additionally the Jews would not have full control over the area. This meant that they would have no power to stop people from using the plaza for various activities, including the driving of mules, which would cause a disturbance to worshippers. Other reports place the scheme's failure on Jewish infighting as to whether the plan would foster a detrimental Arab reaction. In 1895 Hebrew linguist and publisher Rabbi Chaim Hirschensohn became entangled in a failed effort to purchase the Western Wall and lost all his assets. The attempts of the Palestine Land Development Company to purchase the environs of the Western Wall for the Jews just before the outbreak of World War I also never came to fruition. In the first two months following the Ottoman Empire's entry into the First World War, the Turkish governor of Jerusalem, Zakey Bey, offered to sell the Moroccan Quarter, which consisted of about 25 houses, to the Jews in order to enlarge the area available to them for prayer. He requested a sum of £20,000 which would be used to both rehouse the Muslim families and to create a public garden in front of the Wall. However, the Jews of the city lacked the necessary funds. A few months later, under Muslim Arab pressure on the Turkish authorities in Jerusalem, Jews became forbidden by official decree to place benches and light candles at the Wall. This sour turn in relations was taken up by the Chacham Bashi who managed to get the ban overturned. In 1915 it was reported that Djemal Pasha, closed off the wall to visitation as a sanitary measure. Probably meant was the "Great", rather than the "Small" Djemal Pasha. 1840 Ibrahim Pasha of Egypt Forbidding the Jews to pave the passage in front of the Wall. It also cautioned them against "raising their voices and displaying their books there." They were however allowed "to pay visits to it as of old." 1841* Ibrahim Pasha of Egypt "Of the same bearing and likewise to two others of 1893 and 1909." * These firmans were cited by the Jewish contingent at the International Commission, 1930, as proof for rights at the Wall. Muslim authorities responded by arguing that historic sanctions of Jewish presence were acts of tolerance shown by Muslims, who, by doing so, did not concede any positive rights. 1920. From the collection of the National Library of Israel. In December 1917, Allied forces under Edmund Allenby captured Jerusalem from the Turks. Allenby pledged "that every sacred building, monument, holy spot, shrine, traditional site, endowment, pious bequest, or customary place of prayer of whatsoever form of the three religions will be maintained and protected according to the existing customs and beliefs of those to whose faith they are sacred". 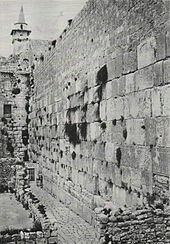 In early 1920, the first Jewish-Arab dispute over the Wall occurred when the Muslim authorities were carrying out minor repair works to the Wall's upper courses. The Jews, while agreeing that the works were necessary, appealed to the British that they be made under supervision of the newly formed Department of Antiquities, because the Wall was an ancient relic. In 1926 an effort was made to lease the Maghrebi waqf, which included the wall, with the plan of eventually buying it. Negotiations were begun in secret by the Jewish judge Gad Frumkin, with financial backing from American millionaire Nathan Straus. The chairman of the Palestine Zionist Executive, Colonel F. H. Kisch, explained that the aim was "quietly to evacuate the Moroccan occupants of those houses which it would later be necessary to demolish" to create an open space with seats for aged worshippers to sit on. However, Straus withdrew when the price became excessive and the plan came to nothing. The Va'ad Leumi, against the advice of the Palestine Zionist Executive, demanded that the British expropriate the wall and give it to the Jews, but the British refused. 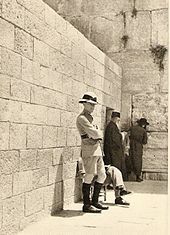 In 1928 the Zionist Organisation reported that John Chancellor, High Commissioner of Palestine, believed that the Western Wall should come under Jewish control and wondered "why no great Jewish philanthropist had not bought it yet". In 1922, a status quo agreement issued by the mandatory authority forbade the placing of benches or chairs near the Wall. The last occurrence of such a ban was in 1915, but the Ottoman decree was soon retracted after intervention of the Chacham Bashi. In 1928 the District Commissioner of Jerusalem, Edward Keith-Roach, acceded to an Arab request to implement the ban. This led to a British officer being stationed at the Wall making sure that Jews were prevented from sitting. Nor were Jews permitted to separate the sexes with a screen. In practice, a flexible modus vivendi had emerged and such screens had been put up from time to time when large numbers of people gathered to pray. The placing of a Mechitza similar to the one in the picture was the catalyst for confrontation between the Arabs, Jews and Mandate authorities in 1928. On September 24, 1928, the Day of Atonement, British police resorted to removing by force a screen used to separate men and women at prayer. Women who tried to prevent the screen being dismantled were beaten by the police, who used pieces of the broken wooden frame as clubs. Chairs were then pulled out from under elderly worshipers. The episode made international news and Jews the world over objected to the British action. Yosef Chaim Sonnenfeld, the Chief Rabbi of the ultraorthodox Jews in Jerusalem, issued a protest letter on behalf of his community, the Edah HaChareidis, and Agudas Yisroel strongly condemning the desecration of the holy site. Various communal leaders called for a general strike. A large rally was held in the Etz Chaim Yeshiva, following which an angry crowd attacked the local police station in which they believed Douglas Valder Duff, the British officer involved, was sheltering. Commissioner Edward Keith-Roach described the screen as violating the Ottoman status quo that forbade Jews from making any construction in the Western Wall area. He informed the Jewish community that the removal had been carried out under his orders after receiving a complaint from the Supreme Muslim Council. The Arabs were concerned that the Jews were trying to extend their rights at the wall and with this move, ultimately intended to take possession of the Al-Aqsa Mosque. The British government issued an announcement explaining the incident and blaming the Jewish beadle at the Wall. It stressed that the removal of the screen was necessary, but expressed regret over the ensuing events. A widespread Arab campaign to protest against presumed Jewish intentions and designs to take possession of the Al Aqsa Mosque swept the country and a "Society for the Protection of the Muslim Holy Places" was established. The Vaad Leumi responding to these Arab fears declared in a statement that "We herewith declare emphatically and sincerely that no Jew has ever thought of encroaching upon the rights of Moslems over their own Holy places, but our Arab brethren should also recognise the rights of Jews in regard to the places in Palestine which are holy to them." The committee also demanded that the British administration expropriate the wall for the Jews. A British inquiry into the disturbances and investigation regarding the principal issue in the Western Wall dispute, namely the rights of the Jewish worshipers to bring appurtenances to the wall, was convened. The Supreme Muslim Council provided documents dating from the Turkish regime supporting their claims. However, repeated reminders to the Chief Rabbinate to verify which apparatus had been permitted failed to elicit any response. They refused to do so, arguing that Jews had the right to pray at the Wall without restrictions. Subsequently, in November 1928, the Government issued a White Paper entitled "The Western or Wailing Wall in Jerusalem: Memorandum by the Secretary of State for the Colonies", which emphasised the maintenance of the status quo and instructed that Jews could only bring "those accessories which had been permitted in Turkish times." A few months later, Haj Amin complained to Chancellor that "Jews were bringing benches and tables in increased numbers to the wall and driving nails into the wall and hanging lamps on them." In the summer of 1929, the Mufti Haj Amin Al Husseinni ordered an opening be made at the southern end of the alleyway which straddled the Wall. The former cul-de-sac became a thoroughfare which led from the Temple Mount into the prayer area at the Wall. Mules were herded through the narrow alley, often dropping excrement. This, together with other construction projects in the vicinity, and restricted access to the Wall, resulted in Jewish protests to the British, who remained indifferent. On August 14, 1929, after attacks on individual Jews praying at the Wall, 6,000 Jews demonstrated in Tel Aviv, shouting "The Wall is ours." The next day, the Jewish fast of Tisha B'Av, 300 youths raised the Zionist flag and sang Hatikva at the Wall. The day after, on August 16, an organized mob of 2,000 Muslim Arabs descended on the Western Wall, injuring the beadle and burning prayer books, liturgical fixtures and notes of supplication. The rioting spread to the Jewish commercial area of town, and was followed a few days later by the Hebron massacre. 133 Jews were killed and 339 injured in the Arab riots, and in the subsequent process of quelling the riots 110 Arabs were killed by British police. This was by far the deadliest attack on Jews during the period of British Rule over Palestine. In 1930, in response to the 1929 riots, the British Government appointed a commission "to determine the rights and claims of Muslims and Jews in connection with the Western or Wailing Wall", and to determine the causes of the violence and prevent it in the future. The League of Nations approved the commission on condition that the members were not British. "Being judged before you today stands a nation that has been deprived of everything that is dear and sacred to it from its emergence in its own land – the graves of its patriarchs, the graves of its great kings, the graves of its holy prophets and, above all, the site of its glorious Temple. Everything has been taken from it and of all the witnesses to its sanctity, only one vestige remains – one side of a tiny portion of a wall, which, on one side, borders the place of its former Temple. In front of this bare stone wall, that nation stands under the open sky, in the heat of summer and in the rains of winter, and pours out its heart to its God in heaven." The Commission concluded that the wall, and the adjacent pavement and Moroccan Quarter, were solely owned by the Muslim waqf. However, Jews had the right to "free access to the Western Wall for the purpose of devotions at all times", subject to some stipulations that limited which objects could be brought to the Wall and forbade the blowing of the shofar, which was made illegal. Muslims were forbidden to disrupt Jewish devotions by driving animals or other means. Yitzchak Orenstein, who held the position of Rabbi of the Kotel, recorded in April 1930 that "Our master, Rabbi Yosef Chaim Sonnenfeld came to pray this morning by the Kosel and one of those present produced a small chair for the Rav to rest on for a few moments. However, no sooner had the Rav sat down did an Arab officer appear and pull the chair away from under him." During the 1930s, at the conclusion of Yom Kippur, young Jews persistently flouted the shofar ban each year and blew the shofar resulting in their arrest and prosecution. They were usually fined or sentenced to imprisonment for three to six months. The Shaw commission determined that the violence occurred due to "racial animosity on the part of the Arabs, consequent upon the disappointment of their political and national aspirations and fear for their economic future." During the 1948 Arab–Israeli War the Old City together with the Wall was controlled by Jordan. 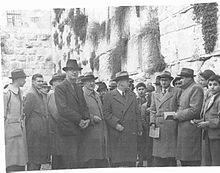 Article VIII of the 1949 Armistice Agreement provided for Israeli Jewish access to the Western Wall. However, for the following nineteen years, despite numerous requests by Israeli officials and Jewish groups to the United Nations and other international bodies to attempt to enforce the armistice agreement, Jordan refused to abide by this clause. Neither Israeli Arabs nor Israeli Jews could visit their holy places in the Jordanian territories. An exception was made for Christians to participate in Christmas ceremonies in Bethlehem. Some sources claim Jews could only visit the wall if they traveled through Jordan (which was not an option for Israelis) and did not have an Israeli visa stamped in their passports. Only Jordanian soldiers and tourists were to be found there. A vantage point on Mount Zion, from which the Wall could be viewed, became the place where Jews gathered to pray. For thousands of pilgrims, the mount, being the closest location to the Wall under Israeli control, became a substitute site for the traditional priestly blessing ceremony which takes place on the Three Pilgrimage Festivals. During the Jordanian rule of the Old City, a ceramic street sign in Arabic and English was affixed to the stones of the ancient wall. Attached 2.1 metres (6 ft 11 in) up, it was made up of eight separate ceramic tiles and said Al Buraq Road in Arabic at the top with the English "Al-Buraq (Wailing Wall) Rd" below. When Israeli soldiers arrived at the wall in June 1967, one attempted to scrawl Hebrew lettering on it. The Jerusalem Post reported that on June 8, Ben-Gurion went to the wall and "looked with distaste" at the road sign; "this is not right, it should come down" and he proceeded to dismantle it. This act signaled the climax of the capture of the Old City and the ability of Jews to once again access their holiest sites. Emotional recollections of this event are related by David ben Gurion and Shimon Peres. The iconic image of Israeli soldiers shortly after the capture of the Wall during the Six-Day War. "There was one moment in the Six-Day War which symbolized the great victory: that was the moment in which the first paratroopers – under Gur's command – reached the stones of the Western Wall, feeling the emotion of the place; there never was, and never will be, another moment like it. Nobody staged that moment. Nobody planned it in advance. Nobody prepared it and nobody was prepared for it; it was as if Providence had directed the whole thing: the paratroopers weeping — loudly and in pain — over their comrades who had fallen along the way, the words of the Kaddish prayer heard by Western Wall's stones after 19 years of silence, tears of mourning, shouts of joy, and the singing of "Hatikvah"". Forty-eight hours after capturing the wall, the military, without explicit government order, hastily proceeded to demolish the entire Moroccan Quarter, which stood 4 metres (13 ft) from the Wall. The Sheikh Eid Mosque, which was built over one of Jerusalem's oldest Islamic schools, the Afdiliyeh, named after one of Saladin's sons, was pulled down to make way for the plaza. It was one of three or four that survived from Saladin's time. 650 people consisting of 106 Arab families were ordered to leave their homes at night. When they refused, bulldozers began to demolish the buildings with people still inside, killing one person and injuring a number of others. When we visited the Wailing Wall we found a toilet attached to it ... we decided to remove it and from this we came to the conclusion that we could evacuate the entire area in front of the Wailing Wall ... a historical opportunity that will never return ... We knew that the following Saturday [sic Wednesday], June 14, would be the Jewish festival of Shavuot and that many will want to come to pray ... it all had to be completed by then. The narrow pavement, which could accommodate a maximum of 12,000 per day, was transformed into an enormous plaza that could hold in excess of 400,000. Several months later, the pavement close to the wall was excavated to a depth of two and half metres, exposing an additional two courses of large stones. A complex of buildings against the wall at the southern end of the plaza, that included Madrasa Fakhriya and the house that the Abu al-Sa'ud family had occupied since the 16th century, were spared in the 1967 destruction, but demolished in 1969. The section of the wall dedicated to prayers was thus extended southwards to double its original length, from 28 to 60 metres (92 to 197 ft), while the 4 metres (13 ft) space facing the wall grew to 40 metres (130 ft). The narrow, approximately 120 square metres (1,300 sq ft) pre-1948 alley along the wall, used for Jewish prayer, was enlarged to 2,400 square metres (26,000 sq ft), with the entire Western Wall Plaza covering 20,000 square metres (4.9 acres), stretching from the wall to the Jewish Quarter. The new plaza created in 1967 is used for worship and public gatherings, including Bar mitzvah celebrations and the swearing-in ceremonies of newly full-fledged soldiers in the Israel Defense Forces. Tens of thousands of Jews flock to the wall on the Jewish holidays, and particularly on the fast of Tisha B'Av, which marks the destruction of the Temple and on Jerusalem Day, which commemorates the reunification of Jerusalem in 1967 and the delivery of the Wall into Jewish hands. Conflicts over prayer at the national monument began a little more than a year after Israel's victory in the Six-Day War, which again made the site accessible to Jews. In July 1968 the World Union for Progressive Judaism, which had planned the group's international convention in Jerusalem, appealed to the Knesset after the Ministry of Religious Affairs prohibited the organization from hosting mixed-gender services at the Wall. The Knesset committee on internal affairs backed the Ministry of Religious Affairs in disallowing the Jewish convention attendees, who had come from over 24 countries, from worshiping in their fashion. The Orthodox held that services at the Wall should follow traditional Jewish law for segregated seating followed in synagogues, while the non-Orthodox perspective was that "the Wall is a shrine of all Jews, not one particular branch of Judaism." The remains of Robinson's Arch above excavated remnants of the ancient street below. At the southern end of the Western Wall, Robinson's Arch along with a row of vaults once supported stairs ascending from the street to the Temple Mount. Because it does not come under the direct control of the Rabbi of the Wall or the Ministry of Religious Affairs, the site has been opened to religious groups that hold worship services that would not be approved by the Rabbi or the Ministry in the major men's and women's prayer areas against the Wall. The need for such an area became apparent when in 1989, after repeated attacks by haredim, activists belonging to a group called Women of the Wall petitioned to secure the right of women to pray at the wall without restrictions. In a 2003 directive, Israel's Supreme Court disallowed any women from reading publicly from the Torah or wearing traditional prayer shawls at the plaza itself, but instructed the Israeli government to prepare the site of Robinson's Arch to host such events. The site was inaugurated in August 2004 and has since hosted services by Reform and Conservative groups, as well as services by the Women of the Wall. In May 2013 a judge ruled that the 2003 Israeli Supreme Court ruling prohibiting women from carrying a Torah or wearing prayer shawls had been misinterpreted and that Women of the Wall prayer gatherings at the wall should not be deemed as disturbing the public order. In November 2010, the government approved a NIS 85m ($23m) scheme to improve access and infrastructure at the site. The Isaiah Stone, located under Robinson's Arch, has a carved inscription in Hebrew from Isaiah 66:14: וראיתם ושש לבכם ועצמותיכם כדשא תפרחנה ("And when ye see this your heart shall rejoice and your bones shall flourish like an herb"). In April 2013, Jewish Agency for Israel leader Natan Sharansky spearheaded a concept that would expand and renovate the Robinson's Arch area into an area where people may "perform worship rituals not based on the Orthodox interpretation of Jewish tradition." 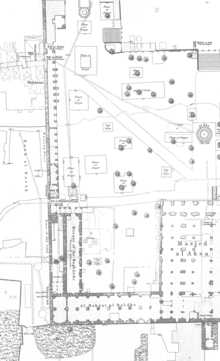 On August 25, 2013, a new 4,480 square foot prayer platform named "Azarat Yisrael Plaza" was completed as part of this plan, with access to the platform at all hours, even when the rest of the area's archeological park is closed to visitors. After some controversy regarding the question of authority over this prayer area, the announcement was made that it would come under the authority of a future government-appointed "pluralist council" that would include non-Orthodox representatives. In January 2016, the Israeli Cabinet approved a plan to designate a new space at the Kotel that would be available for egalitarian prayer and that would not be controlled by the Rabbinate. Women of the Wall welcomed the decision, although Sephardic Chief Rabbi Shlomo Amar of Jerusalem said creating a mixed-gender prayer section was paramount to destroying it. The Chief rabbinate said it would create an alternate plan. In June 2017, it was announced that the plan approved in January 2016 had been suspended. In 2005, the Western Wall Heritage Foundation initiated a major renovation effort under Rabbi-of-the-Wall Shmuel Rabinovitch. Its goal was to renovate and restore the area within Wilson's Arch, the covered area to the left of worshipers facing the Wall in the open prayer plaza, in order to increase access for visitors and for prayer. The restoration to the men's section included a Torah ark that can house over 100 Torah scrolls, in addition to new bookshelves, a library, heating for the winter, and air conditioning for the summer. A new room was also built for the scribes who maintain and preserve the Torah scrolls used at the Wall. New construction also included a women's section, overlooking the men's prayer area, so that women could use this separate area to "take part in the services held inside under the Arch" for the first time. On July 25, 2010, a Ner Tamid, an oil-burning "eternal light," was installed within the prayer hall within Wilson's Arch, the first eternal light installed in the area of the Western Wall. According to the Western Wall Heritage Foundation, requests had been made for many years that "an olive oil lamp be placed in the prayer hall of the Western Wall Plaza, as is the custom in Jewish synagogues, to represent the menorah of the Temple in Jerusalem as well as the continuously burning fire on the altar of burnt offerings in front of the Temple," especially in the closest place to those ancient flames. A number of special worship events have been held since the renovation. They have taken advantage of the cover, temperature control, and enhanced security. However, in addition to the more recent programs, one early event occurred in September 1983, even before the modern renovation. At that time U.S. Sixth Fleet Chaplain Rabbi Arnold Resnicoff was allowed to hold an unusual interfaith service—the first interfaith service ever conducted at the Wall during the time it was under Israeli control—that included men and women sitting together. The ten-minute service included the Priestly Blessing, recited by Resnicoff, who is a Kohen. A Ministry of Religions representative was present, responding to press queries that the service was authorized as part of a special welcome for the U.S. Sixth Fleet. After the 1967 Arab–Israeli war, Rabbi Yehuda Meir Getz was named the overseer of proceedings at the wall. After Rabbi Getz's death in 1995, Rabbi Shmuel Rabinowitz was given the position. Rabbinic tradition teaches that the western wall was built upon foundations laid by the biblical King Solomon from the time of the First Temple. A Midrash compiled in Late Antiquity refers to a western wall of the Temple which "would never be destroyed", and Lamentations Rabbah mentions how Rome was unable to topple the western wall due to the Divine oath promising its eternal survival. Another Midrash quotes a 4th-century scholar: "Rav Acha said that the Divine Presence has never departed from the Western Wall", and the Zohar similarly writes that "the Divine Presence rests upon the Western Wall". Some medieval rabbis claimed that today's Western Wall is a surviving wall of the Temple itself and cautioned Jews from approaching it, lest they enter the Temple precincts in a state of impurity. Many contemporary rabbis believe that the rabbinic traditions were made in reference to the Temple Mount's Western Wall, which accordingly endows the Wall with inherent holiness. 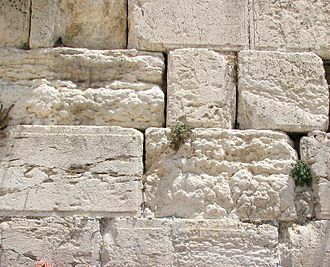 Rabbi Zvi Hirsch Kaindenover discusses the mystical aspect of the Hebrew word kotel when discussing the significance of praying against a wall. He cites the Zohar which writes that the word kotel, meaning wall, is made up of two parts: "Ko", which has the numerical value of God's name, and "Tel", meaning mount, which refers to the Temple and its Western Wall. Eighteenth-century scholar Jonathan Eybeschutz writes that "after the destruction of the Temple, God removed His Presence from His sanctuary and placed it upon the Western Wall where it remains in its holiness and honour". It is told that great Jewish sages, including Isaac Luria and the Radvaz, experienced a revelation of the Divine Presence at the wall. Many contemporary Orthodox scholars rule that the area in front of the Wall has the status of a synagogue and must be treated with due respect. This is the view upheld by the authority in charge of the wall. As such, men and married women are expected to cover their heads upon approaching the Wall, and to dress appropriately. When departing, the custom is to walk backwards away from the Wall. On Saturdays, it is forbidden to enter the area with electronic devices, including cameras, which infringe on the sanctity of the Sabbath. In the past, some visitors would write their names on the Wall, or based upon various scriptural verses, would drive nails into the crevices. These practices stopped after rabbis determined that such actions compromised the sanctity of the Wall. Another practice also existed whereby pilgrims or those intending to travel abroad would hack off a chip from the Wall or take some of the sand from between its cracks as a good luck charm or memento. In the late 19th century the question was raised as to whether this was permitted and a long responsa appeared in the Jerusalem newspaper Havatzelet in 1898. It concluded that even if according to Jewish Law it was permitted, the practices should be stopped as it constituted a desecration. More recently the Yalkut Yosef rules that it is forbidden to remove small chips of stone or dust from the Wall, although it is permissible to take twigs from the vegetation which grows in the Wall for an amulet, as they contain no holiness. Cleaning the stones is also problematic from a halachic point of view. Blasphemous graffiti once sprayed by a tourist was left visible for months until it began to peel away. There was once an old custom of removing one's shoes upon approaching the Wall. A 17th-century collection of special prayers to be said at holy places mentions that "upon coming to the Western Wall one should remove his shoes, bow and recite...". Rabbi Moses Reicher wrote[year needed] that "it is a good and praiseworthy custom to approach the Western Wall in white garments after ablution, kneel and prostrate oneself in submission and recite "This is nothing other than the House of God and here is the gate of Heaven." When within four cubits of the Wall, one should remove their footwear." Over the years the custom of standing barefoot at the Wall has ceased, as there is no need to remove one's shoes when standing by the Wall, because the plaza area is outside the sanctified precinct of the Temple Mount. In Judaism, the Western Wall is venerated as the sole remnant of the Holy Temple. It has become a place of pilgrimage for Jews, as it is the closest permitted accessible site to the holiest spot in Judaism, namely the Even ha-shetiya or Foundation Stone, which lies on the Temple Mount. According to one rabbinic opinion, Jews may not set foot upon the Temple Mount and doing so is a sin punishable by Kareth. While almost all historians and archaeologists and some rabbinical authorities believe that the rocky outcrop in the Dome of the Rock is the Foundation Stone, some rabbis say it is located directly opposite the exposed section of the Western Wall, near the El-kas fountain. This spot was the site of the Holy of Holies when the Temple stood. According to Jewish Law, one is obliged to grieve and rend one's garment upon visiting the Western Wall and seeing the desolate site of the Temple. Bach (17th century) instructs that "when one sees the Gates of Mercy which are situated in the Western Wall, which is the wall King David built, he should recite: Her gates are sunk into the ground; he hath destroyed and broken her bars: her king and her princes are among the nations: the law is no more; her prophets also find no vision from the Lord". Some scholars write that rending one's garments is not applicable nowadays as Jerusalem is under Jewish control. Others disagree, pointing to the fact that the Temple Mount is controlled by the Muslim waqf and that the mosques which sit upon the Temple site should increase feelings of distress. 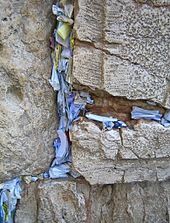 If one hasn't seen the Wall for over 30 days, the prevailing custom is to rend one's garments, but this can be avoided if one visits on the Sabbath or on festivals. According to Donneal Epstein, a person who has not seen the Wall within the last 30 days should recite: "Our Holy Temple, which was our glory, in which our forefathers praised You, was burned and all of our delights were destroyed". The Sages of the Talmud stated that anyone who prays at the Temple in Jerusalem, "it is as if he has prayed before the throne of glory because the gate of heaven is situated there and it is open to hear prayer." Jewish Law stipulates that the Silent Prayer should be recited facing towards Jerusalem, the Temple and ultimately the Holy of Holies, as God's bounty and blessing emanates from that spot. It is generally believed that prayer by the Western Wall is particularly beneficial since it was that wall which was situated closest to the Holy of Holies. Rabbi Jacob Ettlinger writes "since the gate of heaven is near the Western Wall, it is understandable that all Israel's prayers ascend on high there... as one of the great ancient kabbalists Rabbi Joseph Gikatilla said, when the Jews send their prayers from the Diaspora in the direction of Jerusalem, from there they ascend by way of the Western Wall." A well-known segula (efficacious remedy) for finding one's soulmate is to pray for 40 consecutive days at the Western Wall, a practice apparently conceived by Rabbi Yisroel Yaakov Fisher. The Scroll of Ahimaaz, a historical document written in 1050 CE, distinctly describes the Western Wall as a place of prayer for the Jews. In around 1167 CE during the late Crusader Period, Benjamin of Tudela wrote that "In front of this place is the western wall, which is one of the walls of the Holy of Holies. This is called the Gate of Mercy, and hither come all the Jews to pray before the Wall in the open court". In 1625 "arranged prayers" at the Wall are mentioned for the first time by a scholar whose name has not been preserved. Scrolls of the Law were brought to the Wall on occasions of public distress and calamity, as testified to in a narrative written by Rabbi Gedaliah of Semitizi who went to Jerusalem in 1699. "On Friday afternoon, March 13, 1863, the writer visited this sacred spot. Here he found between one and two hundred Jews of both sexes and of all ages, standing or sitting, and bowing as they read, chanted and recited, moving themselves backward and forward, the tears rolling down many a face; they kissed the walls and wrote sentences in Hebrew upon them... The lamentation which is most commonly used is from Psalm 79:1 "O God, the heathen are come into Thy inheritance; Thy holy temple have they defiled." Rev. James W. Lee, 1863. The writings of various travellers in the Holy Land, especially in the 18th and 19th centuries, tell of how the Wall and its environs continued to be a place of devotion for the Jews. Isaac Yahuda, a prominent member of the Sephardic community in Jerusalem recalled how men and women used to gather in a circle at the Wall to hear sermons delivered in Ladino. His great-grandmother, who arrived in Palestine in 1841, "used to go to the Western Wall every Friday afternoon, winter and summer, and stay there until candle-lighting time, reading the entire Book of Psalms and the Song of Songs...she would sit there by herself for hours." In the past women could be found sitting at the entrance to the Wall every Sabbath holding fragrant herbs and spices in order to enable worshipers to make additional blessings. In the hot weather they would provide cool water. The women also used to cast lots for the privilege of sweeping and washing the alleyway at the foot of the Wall. Throughout the ages, the Wall is where Jews have gathered to express gratitude to God or to pray for divine mercy. On news of the Normandy landings on June 6, 1944 thousands of Jews went to the Wall to offer prayers for the "success of His Majesty’s and Allied Forces in the liberation of all enemy-occupied territory." On October 13, 1994, 50,000 gathered to pray for the safe return of kidnapped soldier Nachshon Wachsman. August 10, 2005 saw a massive prayer rally at the Wall. Estimates of people protesting Israel's unilateral disengagement plan ranged from 50,000 to 250,000 people. Every year on Tisha B'Av large crowds congregate at the Wall to commemorate the destruction of the Temple. In 2007 over 100,000 gathered. During the month of Tishrei 2009, a record 1.5 million people visited the site. While during the late 19th century, no formal segregation of men and women was to be found at the Wall, conflict erupted in July 1968 when members of the World Union for Progressive Judaism were denied the right to host a mixed-gender service at the site after the Ministry of Religious Affairs insisted on maintaining the gender segregation customary at Orthodox places of worship. The progressives responded by claiming that "the Wall is a shrine of all Jews, not one particular branch of Judaism." 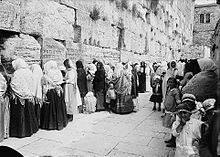 In 1988, the small but vocal Women of the Wall launched a campaign for recognition of non-Orthodox prayer at the Wall. Their form and manner of prayer elicited a violent response from some Orthodox worshippers and they were subsequently banned from holding services at the site. In response to the repeated arrest of women, including Anat Hoffman found flouting the law, the Jewish Agency observed 'the urgent need to reach a permanent solution and make the Western Wall once again a symbol of unity among the Jewish people, and not one of discord and strife." Some commentators called for the closure of the site unless an acceptable solution to the controversy was found. In 2003 Israel's Supreme Court upheld the ban on non-Orthodox worship at the Wall and the government responded by allocating Robinson's Arch for such purposes. But in 2012, critics still complained about the restrictions at the Western Wall, saying Israel had "turned a national monument into an ultra-Orthodox synagogue," and in April 2013 the Jerusalem District Court ruled that as long as there was no other appropriate area for pluralistic prayer, prayer according to non-Orthodox custom should be allowed at the Wall. This led to the expansion and renovation of the Robinson's Arch prayer area which would be placed under the authority of a Pluralist Council. In August 2013, a platform named "Azarat Yisrael Plaza" was completed to facilitate non-Orthodox worship. There is a much publicised practice of placing slips of paper containing written prayers into the crevices of the Wall. The earliest account of this practice is attributed to Rabbi Chaim ibn Attar, (d. 1743). More than a million notes are placed each year and the opportunity to e-mail notes is offered by a number of organisations. It has become customary for visiting dignitaries to place notes too. Shortly after the Western Wall came under Israeli control in 1967, a tefillin stand was erected with permission from Rabbi Yehuda Meir Getz, the first rabbi of the Kotel. The stand offers visitors the chance to put on Tefillin, a daily Jewish ritual. In the months following the Six-Day War an estimated 400,000 Jews observed this ritual at the stand. The stand is staffed by multilingual volunteers and an estimated 100,000 visitors put on tefillin there annually. Islamic reverence for the site is derived from the belief that the Prophet Muhammad tied his steed Buraq nearby during his night journey to Jerusalem. Various places have been suggested for the exact spot where Buraq was tethered, but for several centuries the preferred location has been the al-Buraq mosque, which is just inside the wall at the south end of the present Western Wall plaza. The mosque is located above an ancient passageway, which once came out through the long-sealed Barclay's Gate whose huge lintel is still visible directly below the Maghrebi gate. It is evident from the copy of the record of the deliberations of the Consultative Council in Jerusalem that the place the Jews asked for permission to pave adjoins the wall of the Haram al-Sharif and also the spot where al-Buraq was tethered, and is included in the endowment charter of Abu Madyan, may God bless his memory; that the Jews never carried out any repairs in that place in the past. ... Therefore the Jews must not be enabled to pave the place. Carl Sandreczki, who was charged with compiling a list of place names for Charles Wilson's Ordnance Survey of Jerusalem in 1865, reported that the street leading to the Western Wall, including the part alongside the wall, belonged to the Hosh (court/enclosure) of al Burâk, "not Obrâk, nor Obrat". In 1866, the Prussian Consul and Orientalist Georg Rosen wrote that "The Arabs call Obrâk the entire length of the wall at the wailing place of the Jews, southwards down to the house of Abu Su'ud and northwards up to the substructure of the Mechkemeh [Shariah court]. Obrâk is not, as was formerly claimed, a corruption of the word Ibri (Hebrews), but simply the neo-Arabic pronunciation of Bōrâk, ... which, whilst (Muhammad) was at prayer at the holy rock, is said to have been tethered by him inside the wall location mentioned above." The name Hosh al Buraq appeared on the maps of Wilson's 1865 survey, its revised editions of 1876 and 1900, and other maps in the early 20th century. In 1922, it was the street name specified by the official Pro-Jerusalem Council. Some scholars believe that when Jerusalem came under Christian rule in the 4th century, there was a purposeful "transference" of respect for the Temple Mount and the Western Wall in terms of sanctity to the Church of the Holy Sepulchre, while the sites around the Temple Mount became a refuse dump for Christians. However, the actions of many modern Christian leaders, including Pope John Paul II and Pope Benedict XVI, who visited the Wall and left prayer messages in its crevices, have symbolized for many Christians a restoration of respect and even veneration for this ancient religious site. Most Jews, religious and secular, consider the wall to be important to the Jewish people since it was originally built to hold the Second Temple. They consider the capture of the wall by Israel in 1967 as a historic event since it restored Jewish access to the site after a 19-year gap. There are, however, some haredi Jews who hold different views. Most notable are the adherents of the Satmar hasidic dynasty who retain the views espoused by their Grand Rabbi Joel Teitelbaum, who would not approach the Wall after the 1967 conquest because of his opposition to Zionism, although he did visit the site during his visits to the Holy Land in the 1920s. In 1994, Shlomo Goren wrote that the tradition of the wall as a Jewish prayer site was only 300 years old, the Jews being compelled to pray there after being forbidden to assemble on the mount itself. "The flag that flies over the Kotel is the Israeli flag... Our holy places, the Temple Mount – will remain under Israeli sovereignty forever." Western Wall and Dome of the Rock. "The Western Wall – all its various parts, structures and gates – are an inseparable part of the al-Aqsa compound...The Western Wall is part of Al-Aqsa's western tower, which the Israeli establishment fallaciously and sneakily calls the 'Wailing Wall'. The wall is part of the holy al-Aqsa Mosque". "No stone of the Al-Buraq wall has any relation to Judaism. The Jews began praying at this wall only in the nineteenth century, when they began to develop [national] aspirations." "There is not a single stone in the Wailing Wall relating to Jewish History. The Jews cannot legitimately claim this wall, neither religiously nor historically. The Committee of the League of Nations recommended in 1930, to allow the Jews to pray there, in order to keep them quiet. But by no means did it acknowledge that the wall belongs to them." In 2006, Dr. Hassan Khader, founder of the Al Quds Encyclopedia, told PA television that the first connection of the Jews to the Wall is "a recent one, which began in the 16th century...not ancient...like the roots of the Islamic connection". In November 2010, an official paper published by the PA Ministry of Information denied Jewish rights to the Wall. It stated that "Al-Buraq Wall is in fact the western wall of Al-Aksa Mosque" and that Jews had only started using the site for worship after the 1917 Balfour Declaration. Yitzhak Reiter writes that "the Islamization and de-Judaization of the Western Wall are a recurrent motif in publications and public statements by the heads of the Islamic Movement in Israel." While recognizing the difficulties inherent in any ultimate peace agreement that involves the status of Jerusalem, the official position of the United States includes a recognition of the importance of the Wall to the Jewish people, and has condemned statements that seek to "delegitimize" the relationship between Jews and the area in general, and the Western Wall in particular. For example, in November 2010, the Obama administration "strongly condemned a Palestinian official's claim that the Western Wall in the Old City has no religious significance for Jews and is actually Muslim property." The U.S. State Department noted that the United States rejects such a claim as "factually incorrect, insensitive and highly provocative." ^ "Complete visual compendium of Western Wall". Madain Project. Retrieved 28 March 2018. ^ UN Conciliation Commission (1949). United Nations Conciliation Commission for Palestine Working Paper on the Holy Places. p. 26. The Palestine Administration interpreted the Status Quo in respect of the Wailing Wall as being that the Jewish Community had a right of access to the pavement in front of the Wall for their devotions, but that the Wall itself, the pavement in front of it and the adjacent Moroccan Quarter, were legally Moslem property. The Jews might bring to the Wall only those appurtenances of worship that were allowed under the Ottoman regime. This position was in general reaffirmed by the International Commission appointed by the British Government in 1930, with the approval of the Council of the League of Nations, to enquire into conflicting rights and claims concerning the Wailing Wall. The International Commission further ruled that although the Jews enjoyed no sort of proprietary rights to the Wall or the adjacent pavement, they should have free access to them at all times, subject to certain stipulations. The placing of benches and screens against the Wall was prohibited; the Moslems were similarly forbidden to carry out the Zikr ceremony during the progress of Jewish devotions or to cause annoyance to the Jews in any other way; no political speeches or demonstrations near the Wall were to be allowed; the Moslems' right to repair the pavement was affirmed, and if any repairs were not carried out by them in due time, the work was to be undertaken by the Government. The maintenance of the Wall itself was entrusted to the Government, but it was understood that repairs to it should be carried out only after consultation with the Supreme Moslem Council and the Chief Rabbinate. ^ Cust, L. G. A. (1929). The Status Quo in the Holy Places. H.M.S.O. for the High Commissioner of the Government of Palestine. pp. 44–45. The immediate neighbourhood of the Wailing Wall is inhabited by a number of Moroccan families, who are the beneficiaries of the ancient Waqf dating from the thirteenth century of Abu Midian. Some of the dwellings are entered from the space in front of the Wall. The wall separating the garden to the north from the Wailing Wall was rebuilt without incident in 1929. The wall overlooking the Wailing Wall by the Bab-al-Mughrabi was also rebuilt at the same time. The Moslems wanted to erect a low wall, but it was ruled, to preserve the Status Quo, that the wall must be rebuilt to its former height. 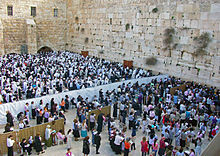 The Wailing Wall, as being one of the few relics of the Temple of Herod of undisputed authenticity, is held in very great veneration by the Jews. Jewish writers refer to it as "the Holiest possession of the fifteen millions of Jews throughout the world which they have not forgotten for one moment since the Dispersion." On Sabbaths and other Holy Days the Wall is thronged with worshippers, the American and European Jew mixing with the Orthodox Jew in his caftan and the Bokharan in his gorgeous silks. The Jewish custom of praying here is of considerable antiquity, being mentioned by Rabbi Benjamin of Tudela and has now become an established right. This right to pray has, however, become linked with the claim to the actual ownership of the Wall. The Moslems resist this on the ground that the Wall is an integral part of the enclosure wall of the Haram al Sharif, and that the space in front of it is a public way, and part of the premises of the Abu Midian Waqf. For this reason the Moslems have always protested against the placing of benches or chairs in front of the Wall by the Jews as causing an obstruction in this public way and implying possessory rights. Though benches have certainly from time to time been introduced, there is extant a resolution taken by the Administrative Council and confirmed by the Mutasarrif in 1912 that chairs or tents or curtains (to divide the women from the men) are not to be allowed. This is still enforced, but portable camp-stools or boxes or tins with cushions are permitted for the convenience of worshippers. This ruling was notified to the Jewish religious authorities and the Police by the District Governor in 1922, and confirmed in 1926 after a rather serious dispute had arisen on account of the introduction of some benches on the previous Day of Atonement (Yom Kippur). ^ Yitzhak Reiter (7 April 2017). Contested Holy Places in Israel–Palestine: Sharing and Conflict Resolution. Taylor & Francis. pp. 26–. ISBN 978-1-351-99884-0. ^ Peters 1984 "One of the best documented endowments, one that embraced the entire quarter of Western Muslims or Maghrebis". ^ "Wailing Wall" appears, for example, in J.J. Reynolds, Jewish Advocate for the Young (1859). H. Bonar, Days and Nights in the East (1866) and J.R. Macduff, Memories of Olivet (1868), and many later works. ^ Shragai 2014 "Dr. Shmuel Berkovitz, a scholar of the holy places in the Land of Israel, found that until the eleventh century, Muslim scholars disagreed as to the location of the tethering of Muhammad's steed and pointed to different places on Al-Haram al-Sharif." ^ "The Story of the Kotel: Facts and Figures". The Western Wall Heritage Foundation. Archived from the original on December 14, 2005. ^ Friedman, Thomas L. (December 1, 1985). "Quarrying History in Jerusalem". New York Times. Retrieved October 18, 2008. Herod the Great certainly used it as the main quarry for building blocks needed to renovate the Temple and its retaining walls, including what is known today as the Wailing Wall. ^ Lefkovits, Etgar (September 12, 2007). "Archeologists find 2nd Temple quarry". Jerusalem Post. Archived from the original on June 19, 2013. Retrieved October 18, 2008. An ancient quarry where King Herod's workers chiseled huge high-quality limestones for the construction of the Second Temple, including the Western Wall, has been uncovered in Jerusalem, the Israel Antiquities Authority announced Sunday(...)Dozens of quarries have previously been uncovered in Jerusalem – including ones larger than the present find – but this is the first one that archeologists have found which they believe was used in the construction of the Temple Mount itself. ^ Ben Dov, Meir; Naor, Mordechai; Aner, Ze'ev (1983). "II: Architecture and Archaeology". The Western Wall. Israel: Ministry of Defence Publishing House. pp. g.41–62. ISBN 965-05-0055-3. ^ a b Jacob Auerbach, Dan Bahat and Shaked Gilboa (2007). "Western Wall". Encyclopedia Judaica. 21 (2nd ed.). Macmillan. pp. 24–27. ISBN 9780028659282. ^ Date is adjusted in some Jewish texts to read 422 BCE. See Chronology of the Bible. ^ "Coin discovery sheds new light on sacred Jerusalem site (AP)". msnbc.com. ^ "Building the Western Wall: Herod Began it but Didn't Finish it". Israel Antiquities Authority. Archived from the original on November 3, 2011. Retrieved November 23, 2011. ^ Date is adjusted in some Jewish texts to read 68 CE. See Chronology of the Bible. ^ a b Neusner, Jacob (2001). "Judaism and the Land of Israel". Understanding Jewish Theology. Global Academic Publishing. pp. g. 79. ISBN 1-58684-090-8. ^ Harman, Graham (2008). "The Holiness of the "Holy Land"". A History of Palestine. Princeton University Press. pp. g.24. ISBN 0-691-11897-3. ^ Gold, Dore (2007). The Fight for Jerusalem. Regnery. pp. g.56. ISBN 1-59698-029-X. ^ David M. Gitlitz & Linda Kay Davidson "Pilgrimage and the Jews" (Westport: CT: Praeger, 2006)42-. ^ Jacob Mann (1972). Texts and Studies in Jewish History and Literature: Ḳaraitica. Ktav Pub. House. p. 20. Retrieved May 17, 2013. An improvement evidently took place after the Fatimid conquest in 970 when permission was granted to pray not at a gate but at the Western Wall (כותל מערבי). This permission may have been due to the intervention of Paltiel, the first Egyptian Nagid. Paltiel's son, Samuel, on the occasion of the transference' of his parents' remains to Jerusalem, donated among other gifts money for "oil for the sanctuary at the Western Wall, for the altar that is inside" (ושמן למקדש בכותל מערבי למזבח שבפנים). ^ R. Bonfil (2009). History and Folklore in a Medieval Jewish Chronicle: The Family Chronicle of Aḥima'az Ben Paltiel. BRILL. p. 336. ISBN 978-90-04-17385-9. Retrieved May 17, 2013. ^ Yosef Levanon (July 1, 1980). The Jewish travellers in the twelfth century. University Press of America. p. 259. ISBN 978-0-8191-1122-7. Retrieved May 17, 2013. The scroll of Ahim'as (11th century) speaks of a synagogue near the Western Wall. ^ Simon Goldhill (October 30, 2009). Jerusalem: City of Longing. Harvard University Press. pp. 74–75. ISBN 978-0-674-03468-6. Retrieved May 20, 2013. Perhaps the earliest evidence for the Western Wall being used for prayer is found in the Itinerary of Benjamin of Tudela, who visited Jerusalem at some point between 1169 and 1171 on his long trip around the east from Spain, when the city was ruled by the Crusaders. […] This is a confused account: the Gate of Mercy is in the Eastern Wall. But it may imply that the Western Wall was also used for prayer. ^ David Philipson (1968). Hebrew Union College Annual. 6 (1930 ed.). Hebrew Union College. p. 7. Retrieved May 20, 2013. How this confusion between the Golden Gate and the Western Wall could have arisen it is difficult to imagine, unless it be due to the fact that both spots may have been favourite places of prayer for the Jews of the Middle Ages, just as the Western or Wailing Wall continues to be still today. The fact that this confusion seems to have existed only with Jewish travellers would tend to corroborate this hypothesis. ^ Fred Skolnik; Michael Berenbaum (2007). Encyclopaedia Judaica. Macmillan Reference USA. p. 25. ISBN 978-0-02-865949-7. Retrieved May 20, 2013. In the 12th century Benjamin of Tudela mentions Jews coming to the Western Wall for prayers and to the "Mercy Gate," but it is possible that the other walls to the south and east also served a similar purpose. Later visiting rabbis (12th-15th centuries) also refer to the walls of the Temple Mount, but they too, are not specific in terms of a gathering spot for Jewish worship along the Western Wall. The Western Wall is not mentioned at all by Nahmanides (13th century) in his detailed account of the Temple site in 1267 nor in the report of Estori ha-Parhi (14th century). It does not figure even in descriptions of Jerusalem in Jewish sources of the 15th century (e.g., Meshullam of Volterra, Obadiah of Bertinoro, etc.). The name Western Wall, used by Obadiah, refers - as can be inferred from the context - to the southwestern corner of the wall, and there is no hint that there was a place of Jewish worship there. It is only from the 16th century that Jews began praying at the present location and this is clear from the available sources. Thenceforth all literary sources describe it as a place of assembly and prayer for Jews. Transmitted by Moses Hagiz, it was the sultan Selim I, the conqueror of Jerusalem, who recovered the Wall from underneath the dungheap which was hiding it and granted permission to the Jews to hold prayers there. ^ Gilbert, Martin (1977). "The 'Wailing Wall' Under Ottoman rule 1517–1917". 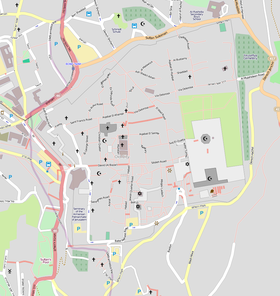 Jerusalem Illustrated History Atlas. London: Board of Deputies of British Jews. pp. g.31. ISBN 0-905648-04-8. ^ Yaakov Dovid, Shulman (1992). "A Letter to My Father". Pathway to Jerusalem. USA: CIS Publishers. pp. g. 59. ISBN 1-56062-130-3. 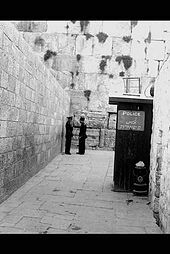 Adler preferred the generic translation "western wall" rather than "Western Wall". Elkan Nathan Adler (1987). Jewish Travellers in the Middle Ages. Dover. p. 240. ^ Harman, Graham (2008). "The Mufti and the Wailing Wall". A History of Palestine. Princeton University Press. pp. g.225. ISBN 0-691-11897-3. ^ Ricca, Simone (2007). "Notes to Chapter One". Reinventing Jerusalem. I.B.Tauris. pp. g. 212. ISBN 1-84511-387-X. ^ a b Armstrong 2001 "In the 16th century, Ottoman Sultan Suleiman the Magnificent permitted the Jews to make the Western Wall their official holy place and had his court architect Sinan build an oratory for them there." ^ a b Gonen 2003, pp. 135–7 "It is possible that official recognition of the right of Jews to pray by the Wall was granted already in the second half of the sixteenth century by a firman (official decree) issued by Suleiman the Magnificent. This firman may have been related to the efforts of the Ottoman ruler to lure Jews to Palestine as a counterbalance to the Arab population, which had rebelled against the new rulers, who were Turkish rather than Arabs." ^ Schwarz, Joseph (1850). "Moriah, The Temple Mount". Descriptive Geography and Brief Historical Sketch of Palestine. Philadelphia: A. Hart. ^ Rossoff, Dovid (1998). "The Era of Suffering: 1800–1840". Where Heaven Touches Earth. Jerusalem: Guardian Press. pp. g.186. ISBN 0-87306-879-3. ^ Rossoff, Dovid (1998). "Bound Within the Walls: 1840–1870". Where Heaven Touches Earth. Jerusalem: Guardian Press. pp. g.231. ISBN 0-87306-879-3. ^ a b c d e f g Ben Dov, Meir; = Naor, Mordechai; Aner, Ze'ev (1983). "IV: Sanctity, Law and Customs". The Western Wall. Israel: Ministry of Defence Publishing House. pp. g.83–97. ISBN 965-05-0055-3. ^ Fred Skolnik; Michael Berenbaum (2007). Encyclopaedia Judaica: Ra-Sam. Macmillan Reference USA in association with the Keter Pub. House. p. 422. ISBN 978-0-02-865945-9. His brother, Mordecai Rosanes, financed the paving of the Western Wall area in Jerusalem in 1874. ^ a b Rossoff, Dovid (1998). "Beyond the Walls: 1870–1900". Where Heaven Touches Earth. Jerusalem: Guardian Press. pp. 330–331. ISBN 0-87306-879-3. ^ Stockman-Shomron, Israel (1984). "Jerusalem in Islam: Faith and Politics". Israel, the Middle East and the Great Powers. Transaction Publishers. pp. g.43. ISBN 965-287-000-5. ^ Lang, Yossef. "The Hirschensohn Family of Publishers in Jerusalem, 1882–1908". Kesher Issue 29. ^ Gilbert, Martin (1996). "War, 1914–1917". Jerusalem in the Twentieth Century. London: Chatto & Windus. pp. g.42. ISBN 0-7011-3070-9. ^ The Advocate: America's Jewish journal. 1915. p. 638. Retrieved January 3, 2012. According to a report in the Jaffa Hebrew weekly, Hapoel Hazair, the Commander of the Turkish Army, Djemal Pasha, has ordered a barricade to be placed across the approach to the Wailing Wall to prevent this place from being visited by Jews. The order is said to be based on sanitary grounds. ^ "REPORT of the Commission appointed by His Majesty's Government in the United Kingdom of Great Britain and Northern Ireland, with the approval of the Council of the League of Nations, to determine the rights and claims of Moslems and Jews in connection with the Western or Wailing Wall at Jerusalem". United Nations. December 1930. Retrieved December 20, 2009. ^ Janin, Hunt (2002). "Pilgrimages During the British Mandate and Under the Israelis (1917–2001)". Four Paths to Jerusalem. McFarland. pp. g.192. ISBN 0-7864-1264-X. ^ a b Gilbert, Martin (1996). "British Military Rule, 1918–1919". Jerusalem in the Twentieth Century. London: Chatto & Windus. pp. g.69. ISBN 0-7011-3070-9. ^ a b Wasserstein, Bernard (2001). "Trouble on the Temple Mount". 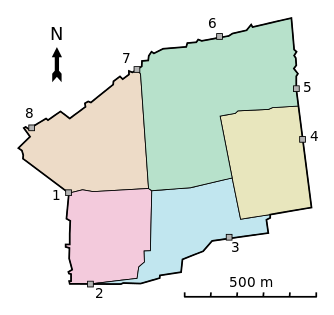 Divided Jerusalem. London: Profile Books. pp. g.323. ISBN 1-86197-333-0. ^ Shepherd, Naomi (1999). "From Conquest to Colony". Ploughing Sand: British Rule in Palestine. London: John Murray. pp. g.42. ISBN 0-7195-5707-0. ^ a b c d Bernhard Wasserstein (1978). The British in Palestine. London: Royal Historical Society. pp. 224–227. ^ Tom Segev (2001). One Palestine, Complete. Abacus. p. 301. ^ Shepherd, Naomi (1999). "The Law Factory". Ploughing Sand: British Rule in Palestine. London: John Murray. pp. g.111. ISBN 0-7195-5707-0. ^ a b c Danziger, Hillel (1990). "The Kosel Affair". Guardian of Jerusalem. New York: Artscroll. pp. g.452–470. ISBN 0-89906-458-2. ^ a b Kassim, Anis F. (1998). "Special Report". The Palestine Yearbook of International Law 1996-1997. Martinus Nijhoff. pp. g.375. ISBN 90-411-1009-7. ^ Kayyālī, Abd al-Wahhāb (1978). "The Lull: 1923–1929". Palestine: A Modern History. Routledge. pp. g. 139. ISBN 0-85664-635-0. ^ a b Ovendale, Ritchie (2004). "British Paramountcy over Arabs and Zionists". The Origins of the Arab-Israeli Wars. Pearson Education. pp. g.71. ISBN 0-582-82320-X. ^ Dershowitz, Alan (2003). "5: Were the Jews Unwilling to Share Palestine?". The Case For Israel. Hoboken, New Jersey: John Wiley & Sons. pp. g.43. ISBN 0-471-46502-X. ^ Ovendale, Ritchie (2004). "The "Wailing Wall" Riots". The Origins of the Arab-Israeli Wars. Pearson Education. pp. g.71. ISBN 0-582-82320-X. The Mufti tried to establish Muslim rights and the Jews were deliberately antagonised by building works and noise. ^ Harman, Graham (2008). "The Mufti and the Wailing Wall". A History of Palestine. Princeton University Press. pp. g.230. ISBN 0-691-11897-3. From 1929 onward, the Supreme Muslim Council intensified construction work on the Haram al-Sharif in order to demonstrate their exclusive claims to the Temple Mount (...) Not without reason, Jewish believers felt disturbed in their prayer. ^ a b c Ben Dov, Meir; Naor, Mordechai; Aner, Ze'ev (1983). "VI: The Struggle for the Wall". The Western Wall. Israel: Ministry of Defence Publishing House. pp. g.123–137. ISBN 965-05-0055-3. ^ "'File 15/18 FOREIGN AND POLITICAL DEPARTMENT CIRCULARS RECEIVED FROM THE GOVT OF INDIA' IOR/R/15/2/1461". Qatar Digital Library. ^ Kayyālī, Abd al-Wahhāb (1978). "The Lull: 1923–1929". Palestine: A Modern History. Routledge. pp. g. 140. ISBN 0-85664-635-0. ^ Gilbert, Martin (1977). "Jerusalem, Zionism and the Arab Revolt 1920–1940". Jerusalem Illustrated History Atlas. London: Board of Deputies of British Jews. pp. g.79. ISBN 0-905648-04-8. ^ "Profile of David Yellin". The Jewish Virtual Library. Fort Washington, MD. Retrieved December 30, 2013. ^ Israel-Jordan Armistice Agreement, Article VIII §2: «free access to the Holy Places and cultural institutions and use of the cemetery on the Mount of Olives». ^ Martin Gilbert, Jerusalem in the Twentieth Century (New York: John Wiley & Sons, 1996, p254. ^ a b Israeli, Raphael (2002). "Introduction: Everyday Life in Divided Jerusalem". Jerusalem Divided: The Armistice Regime, 1947–1967. Jerusalem: Routledge. p. 23. ISBN 0-7146-5266-0. ^ Ross, Marc Howard (2007). "Digging up the past to contest the present: politics and archeology in Jerusalem's Old City". Cultural Contestation in Ethnic Conflict. Cambridge University Press. pp. g.179. ISBN 0-521-87013-5. ^ Israeli, Raphael (2002). "Introduction: Everyday Life in Divided Jerusalem". Jerusalem Divided: The Armistice Regime, 1947–1967. Jerusalem: Routledge. pp. g.6. ISBN 0-7146-5266-0. ^ Bezalel Narkiss (1970). Picture history of Jewish civilization. H. N. Abrams. p. 241. Retrieved May 19, 2011. An Israeli soldier writes the Hebrew name on a street sign, which had previously had only Arabic and English lettering identifying the location as Wailing Wall Road. ^ Jāmiʻat al-Kuwayt; Institute for Palestine Studies (Washington, D.C.); Muʾassasat al-Dirāsāt al-Filasṭīnīyah (1972). Journal of Palestine studies. University of California Press for Kuwait University and the Institute for Palestine Studies. p. 187. Retrieved May 19, 2011. ^ דורון בר (2007). לקדש ארץ. יד יצחק בן צבי. p. 207. Retrieved May 19, 2011. The symbolic removal of a sign placed by the Jordanians in English and Arabic, which referred to the Western Wall plaza as al-Buraq, was part of the process of 'Judaization' and return of the site to the status of the most important holy place of the Jewish people, and now the most holy place inside Israel. ^ Shimon Peres; David Landau (1995). Battling for peace: a memoir. Random House. p. 94. ISBN 978-0-679-43617-1. Retrieved May 18, 2011. ^ Maurice David Japheth; P. K. Rajiv (1967). The Arab Israel conflict: an Indian viewpoint. Pearl Publications. p. 19. The Chief Chaplain of the Army, Brigadier (Rabbi) Goren, offered prayers for four hours at the Wall. He proclaimed that Israel would never again relinquish the Wall. A little later, the Minister for Defence, Moshe Dayan, accompanied by the Chief of Staff, General Yitzhak Rabin, arrived. They repeated the pledge of the Rabbi. "Today we have reunited Jerusalem. We have returned to all that is holy in our land. We have returned, never to be parted from it again," Dayan said. ^ Rabin, Yitzchak (May 29, 1995). "Address to the Knesset by Prime Minister Rabin on Jerusalem, May 29, 1995". Israel Ministry of Foreign Affairs. ^ Nir Hasson,'Rare photograph reveals ancient Jerusalem mosque destroyed in 1967,' at Haaretz, June 15, 2012. ^ Tom Segev (2007). 1967. Metropolitan Books. pp. 400–401. ^ Ari Shavit,'Jerusalem-born thinker Meron Benvenisti has a message for Israelis: Stop whining,' at Haaretz, October 11, 2012. ^ Gershom Gorenberg, The End of Days: Fundamentalism and the Struggle for the Temple Mount. Oxford University Press, 2002 p.102. ^ Henry Cattan, The Palestine Question, Taylor & Francis, 1988 p.256. ^ Weizman, Eyal (2007). Hollow Land. London: Verso. pp. g.38. ISBN 978-1-84467-125-0. ^ Benvenisti, Meron (1998). "Hollowed Ground". City of Stone: The Hidden History of Jerusalem. University of California Press. pp. g.82. ISBN 0-520-20768-8. ^ Meron Benvenisti (1976). Jerusalem: the Torn City. University of Minnesota Press. pp. 312–313. ^ Robert Schick. "Mamluk and Ottoman Jerusalem". In Gideon Avni and Katharina Galor. Unearthing Jerusalem : 150 Years of Archaeological Research in the Holy City. pp. 475–490. ^ a b From the Archive: First rumblings in the battle for pluralism at the Western Wall JTA, April 24, 2015. ^ a b Jewish Virtual Library, retrieved March 26, 2011. ^ a b Nathan-Kazis, Josh (February 5, 2010). "Embassy Letter on Kotel Rubs Salt in the Wound". The Jewish Daily Forward. New York, New York. Retrieved July 13, 2010. 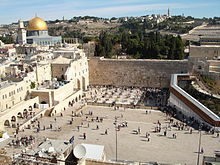 ^ Israel approves $23 million plan to renovate near Western Wall, Haartez, (November 21, 2010). ^ a b Guttman, Nathan and Jane Eisner. "Kotel Egalitarian Prayer Plan Set in Motion by Dramatic Western Wall Compromise." The Jewish Daily Forward. April 10, 2013. April 11, 2013. ^ a b Jaffay, Nathan, "Is Western Wall Prayer Platform a Step Forward For Women -- or Back? ", The Jewish Daily Forward, August 30, 2013. Retrieved June 15, 2014. ^ a b Pollack, Suzanne, Separate — but not equal, Washington Jewish Week, August 28, 2013. Retrieved June 16, 2014. ^ a b "Pluralist Council Will Oversee Robinson's Arch at Western Wall", Jewish Daily Forward (from Jewish Telegraphic Agency press release), published March 6, 2014. Retrieved June 15, 2014. ^ "Israel Approves Prayer Space at Western Wall for Non-Orthodox Jews". The New York Times. February 1, 2016. ^ Sales, Ben (2017-06-26). "Suspension of Western Wall deal leaves Jewish leaders feeling betrayed – J". Jweekly.com. Retrieved 2017-07-21. ^ "Israel freezes Western Wall compromise that was to create egalitarian prayer section | Jewish Telegraphic Agency". Jta.org. 2017-06-25. Retrieved 2017-07-21. ^ a b c English.thekotel.org TheKotel.org, retrieved March 11, 2011. ^ iaa-conservation.org, retrieved March 11, 2011. ^ Jerusalem Post, Sep 5, 1983, and Jerusalem Post International Edition, Sep 11–17, 1983, "U.S. Navy Chaplain Conducts Western Wall Interfaith Litany"
^ "The day Israel gave its blessing to egalitarian prayer at Western Wall". ^ "Obituaries: Yehuda Meir Getz, Western Wall's Rabbi, 71". New York Times. September 25, 1995. Retrieved October 7, 2008. ^ "Rabbi Shmuel Rabinowitz". ALEH. Archived from the original on October 12, 2007. Retrieved October 7, 2008. ^ Horovitz, Ahron (2001). Jerusalem: Footsteps Through Time. Jerusalem: Feldheim. However, today there is no doubt that the wall is the western retaining wall of the Temple Mount and the Midrash refers to the Temple in its broader sense, that is, the Temple Mount. ^ See also Kav ha-Yashar Ch. 93 and Shem Ha-gedolim for a similar account with Rabbi Avraham Ha-levi of Safed. ^ a b Yosef, Ovadia (1990). "Laws of Kotel HaMa'aravi". Yalkut Yosef. Jerusalem. Vol. 2, pg.278–282. ^ Shragai, Nadav (October 5, 2006). "Western Wall rabbi forbids proposed burning of prayer notes". Haaretz. Archived from the original on December 28, 2007. Retrieved December 16, 2007. ^ Radbaz Responsa 691: "Under the dome on the Temple Mount, which the Arabs call El-Sakhrah, without a doubt, is the location of the Foundation Stone. "; Ya'ari, Avraham: Igrot Eretz Yisrael by Obadiah ben Abraham, Ramat Gan 1971: "I sought the place of the Foundation Stone where the Ark of the Covenant was placed, and many people told me it is under a tall and beautiful dome which the Arabs built in the Temple precinct." ^ Sternbuch, Moishe Teshuvos Ve-hanhagos Vol. 3, Ch. 39: "In truth they have erred, thinking that the stone upon they built their dome was in fact the Foundation Stone, however, most possibly, the Stone is located further to the south in the open space opposite the exposed section of the Western Wall." ^ Bayit Chadash to Orach Chaim 561. He contends that the city itself is in such a state of disrepair that once a person has reached the hills surrounding Jerusalem, he can immediately view the Western Wall. ^ Kitzur Shulchan Aruch 18:10. The Kaf hachaim (Orach Chaim 94:1:4 citing Radvaz Vol. 2; Ch. 648) rules that if a Jew was forced onto the Temple Mount and the time of prayer arrived while he’s standing between the Western Wall and the place of the Holy of Holies, "he should pray facing towards the Holy of Holies even though his back will be facing the Western Wall." ^ Kiel, Dvora (2007). When the Time is Right: Manifestations of Divine Providence in everyday life. Feldheim Publishers. p. 486. ISBN 965-7371-29-5. ^ "Origin of the 40 Days". westernwallprayers.org. 2012. Retrieved March 18, 2012. ^ Adler N. M. (1907) The Itinerary of Benjamin of Tudela London; page 23. ^ Deutsch, Nathaniel (2003). "In the Holy Land". The Maiden of Ludmir. University of California Press. pp. g.199. ISBN 0-520-23191-0. ^ Gilbert, Martin (1996). "The Second World War, 1939–1945". Jerusalem in the Twentieth Century. London: Chatto & Windus. pp. g.167. ISBN 0-7011-3070-9. ^ Gilbert, Martin (1996). "Towards the Twenty-First Century". Jerusalem in the Twentieth Century. London: Chatto & Windus. pp. g.353. ISBN 0-7011-3070-9. ^ Marciano, Ilan (August 10, 2005). "70,000 protest pullout at Western Wall". Ynet. Retrieved December 26, 2007. ^ Ratzlav-Katz, Nissan (July 23, 2007). "100,000 Jews At Western Wall for Tisha B'Av 5767". Arutz Sheva. Retrieved December 26, 2007. ^ Judith Weil. "Kosel Visitors record", Jewish Tribune, October 22, 2010. ^ "History". Women of the Wall - נשות הכותל. Archived from the original on March 8, 2016. ^ a b "Pending deal with Women of the Wall would annul regulations banning non-Orthodox practice at Kotel". ^ Bleiweiss, Robert. "Tear Down the Western Wall". Jewish Spectator, 1997. p.3: "There is no quick or easily acceptable way to change this sorry situation, so the blighted thing probably ought to be torn down before its continued presence leads to the irreparable splitting of the Jews and perhaps even civil war and the end of the state of Israel." ^ Rudoren, Jodi (December 26, 2012). "Israel to Review Curbs on Women's Prayer at Western Wall". New York Times. ^ Sperling, Avraham Yitzchak (1999). Sefer Tamei Ha-minhagim U’mekorei Ha-dinim; Inyanei Hilula D’Rashbi, p. 270. Jerusalem: Shai Le-morah Publishing. ^ "Obama's Private Prayer 'Leaked'". Time. July 25, 2008. Retrieved August 19, 2009. ^ "Letter Placed by Pope John Paul II at the Western Wall". Ministry of Foreign Affairs (Israel). Retrieved October 7, 2008. ^ McGirk, Tim (July 25, 2008). "Obama's Private Prayer Leaked". Time Magazine. ^ Schapiro, Leo (November 25, 1967). "Lubavitchers Push Tefillin Campaign". Boston Globe. Since the Six Day War in June which resulted in the creation of a united Jerusalem as part of Israel, more than 400,000 members of the Jewish faith are estimated to have observed the commandment to wear Phylacteries--tefillin In Hebrew--at the city's Western, formerly known as the "Wailing” Wall. ^ Margolin, Dovid (May 15, 2017). "50 Years After Six-Day War, How the Kotel Became Synonymous With Tefillin". Chabad.org. ^ Amikam Elad (1999). Medieval Jerusalem and Islamic Worship. Leiden: Brill. pp. 101–102. ^ F. E. Peters (1985). Jerusalem. Princeton: Princeton University Press. pp. 541–542. . Arabic text in A. L. Tibawi (1978). The Islamic Pious Foundations in Jerusalem. London: The Islamic Cultural Centre. Appendix III. ^ G. Rosen (1866). Das Haram von Jerusalem und der Tempelplatz des Moria. Gotha. pp. 9–10. Die ganze Mauerstrecke am Klageplatz der Juden bis südlich an die Wohnung des Abu Su'ud und nördlich an die Substructionen der Mechkemeh wird von den Arabern Obrâk genannt, nicht, wie früher behauptet worden, eine Corruption des Wortes Ibri (Hebräer), sondern einfach die neu-arabische Aussprache von Bōrâk, [dem Namen des geflügelten Wunderrosses,] welches [den Muhammed vor seiner Auffahrt durch die sieben Himmel nach Jerusalem trug] und von ihm während seines Gebetes am heiligen Felsen im Innern der angegebenen Mauerstelle angebunden worden sein soll. ^ Council of the Pro-Jerusalem Society (1924). C. R. Ashby, ed. Jerusalem 1920-1922. London: John Murray. p. 27. ^ a b USCatholic.org, retrieved March 27, 2011. ^ Wein, Berel. Triumph of Survival; Section VIII – The Modern Jew 1958–1988, pg. 451. ^ Shargai, Nadav (May 14, 2007). "Poll: 96% of Israeli Jews won't give up Western Wall for peace". Haaretz. Archived from the original on May 15, 2007. Retrieved March 4, 2008. ^ Ben Gedalyahu, Tzvi (May 22, 2009). "Bibi Rejects Obama's 'UN Flag at Kotel'; Star of David to Remain". Arutz 7. israelnationalnews.com. Retrieved November 25, 2011. ^ Wasserstein, Bernard (2001). "Annexation". Divided Jerusalem. London: Profile Books. pp. g.233. ISBN 1-86197-333-0. ^ Nahmias, Roee (February 18, 2007). "Sheikh Salah: Western Wall belongs to Muslims". Ynet. Retrieved December 7, 2007. ^ "Alburaq Revolution". Palestinian National Authority. Archived from the original on July 15, 2004. Retrieved December 7, 2007. ^ On Jewish rights to the Western Wall in Jerusalem, Voice of Palestine, June 12, 1998. ^ "Arab Leaders Deny Jewish History on The Temple Mount". ADL. August 6, 2003. Retrieved December 7, 2007. ^ Klein, Aaron (October 25, 2006). "Quick Takes: News From Israel You May Have Missed". The Jewish Press. Retrieved March 11, 2013. ^ Khaled Abu Toameh. Jews have no right to Western Wall, PA 'study' says, Jerusalem Post, (November 22, 2010). ^ Yitzhak Reiter (2008). Jerusalem and its role in Islamic solidarity. Palgrave Macmillan. p. 57. ISBN 978-0-230-60782-8. Retrieved June 10, 2011. ^ Cleveland.com, retrieved March 27, 2011. Armstrong, Karen (April 16, 2001). "Islam's Stake". TIME. Retrieved October 8, 2008. Barclay, James Turner (1858). "Modern Jerusalem". City of the Great King. Challen. Becher, Mordechai (2005). "The Land of Israel". Gateway to Judaism. Mesorah Publications. ISBN 1-4226-0030-0. Ben-Dov, Meir; Naor, Mordechai; Aner, Ze'ev (1983). The Western Wall. Israel: Ministry of Defence. ISBN 965-05-0055-3. Bleiweiss, Robert (1997). "Tear Down the Western Wall". Jewish Spectator. Chertoff, Mordecai S. (1975). Zionism: a basic reader. Herzl Press. Gonen, Rivka (2003). Contested Holiness. KTAV Publishing. ISBN 0-88125-799-0. Halkin, Hillel (January 21, 2001). ""Western Wall" or "Wailing Wall"?". Forward. Retrieved September 28, 2015. Idinopulos, Thomas A. (1994). Jerusalem: A History of the Holiest City as Seen Through the Struggles of Jews, Christians, and Muslims. Ivan R. Dee, Publisher. ISBN 978-1-56663-062-7. Lee, James W. (1863). Earthly Footsteps of the Man of Galilee. Retrieved May 31, 2009. Mock, Steven (2011). "Theories of Nations and Nationalism". Symbols of Defeat in the Construction of National Identity. Cambridge University Press. ISBN 978-1-139-50352-5. Peters, F. E. (1984). Jerusalem. Princeton, New Jersey: Princeton University Press. pp. 357–359, 394–396. Shragai, Nadav (2014). ""Al-Aksa Is in Danger": The Lie that Won't Die". Jerusalem Center for Public Affairs. Retrieved September 27, 2015. Vilnay, Zev (2003). "How the Wall was discovered". Legends of Palestine. Kessinger Publishing. ISBN 0-7661-4128-4. Warner, Charles Dudley (1878). "Jerusalem". In the Levant. Houghton. Wilson, Charles (1881). Picturesque Palestine. 1. Retrieved May 31, 2009. The World Book Encyclopedia. World Book. 2007. ISBN 978-0-7166-0107-4. Western Wall Online Hub - online services related to the Kotel: Prayer note, Live cam & Information.